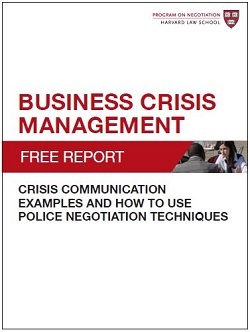 In this free special report, Business Crisis Management: Crisis Communication Examples and How to Use Police Negotiation Tecniques – negotiation experts offers advice on how to turn crisis situations into collaborative negotiations. Throughout the report, you will discover how to apply the lessons of professional hostage negotiators, avoid disasters through careful planning, diffuse tensions with angry members of the public, and break through impasse with open communication. This free special report provides strategies on turning a crisis situation into collaborative negotiations. In this valuable report, you’ll uncover proven strategies and techniques for turning hostile situations into collaborative negotiations, being forward-thinking during negotiations and working with counterparts to find an agreeable solution To download your free report, simply click the button below. The approaches outline in this report highlight the importance of negotiation training, skills, and knowledge. In crisis negotiations, emotions run high. Hostage negotiators are skilled at easing tensions and building trust through an open dialogue. Their three proven techniques can turn even the most hostile situation into a collaborative negotiation. A common trap for negotiators is to focus on the short-term win. Yet, it’s important for negotiators to be forward thinking during the negotiation to ensure they recognize the warning signs of a potential crisis. When confronted with negative publicity, executives become so focused on managing the crisis that they forget they are even in a negotiation. Experts in conflict management suggest that even when an agreement seems impossible, parties should work together to create value. I am heading for mediation and would like the learn about the best first signs to know whether or not the other side is serious about mediation or just playing hardball.